While there may be a bit of wry reality in his statements (no athlete is really shooting for silver) every Olympic event gives out the Silver Medal as the second highest honor that an athlete can achieve in international competition. It’s an achievement, not a demerit. …occasionally it’s the Silver Medalist. This year’s Olympics have featured quite a few petulant 2nd placers, not the least of which is 16 year-old American gymnast McKayla Maroney. While Maroney’s athletic performance fell shy of the Gold, her dramatic performance during the medal ceremony will be remembered for years to come. Maroney couldn’t force her face to hide her disappointment, and she also couldn’t bring her eyes to look at the medal after receiving it. She actually crossed her arms in front of it, hiding it from view. What happens to a person when their dreams don’t come true? How do they respond when they can’t have what they want? Within a matter of days, the “McKayla Is Not Impressed” meme took the internet by storm; digitally altered images of the disgruntled gymnast photo-bombing spectacular events began appearing in email inboxes and evening news stories. There was some measure of relief in the happening, people seem to have taken up a good-natured teasing of Maroney and forgotten about the previously deplorable Olympic fad of making fun of Gabby Douglas’ hair. 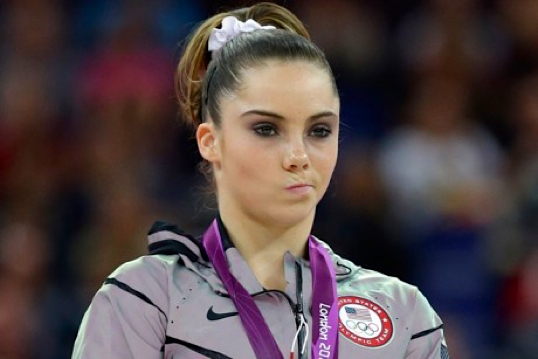 For her part, McKayla Maroney seems to be taking the ribbing quite well. She tweeted, “this tumblr is kinda funny, made me laugh” , after learning of the site dedicated to posting pseudo pictures of her disapproval. Is it wrong to be disappointed that you didn’t win? Is it reasonable to expect that a 16 year-old would be able to hide her feelings? I guess the questions come down to what she is disappointed about really. If McKayla Maroney is angry out of envy or spite, then her display probably really was as ugly as many thought it to be it. But what if it comes from something else? What if it was an actual display of honesty? You know honesty, that thing we always say that we want but then get angry when someone gives us. What if she had bigger dreams for herself but then couldn’t accomplish them? Wouldn’t regret and frustration be the natural feelings that accompany missing a global mark by the slightest of margins? I suspect that a lot of our negative reaction to this story comes from the fact that we’re all used to watching adolescents pout when they can’t get their way, but isn’t the real problem that they are pouting about someone else not “giving in” to them? In a strange twist, Maroney’s frustration is with her own performance. How rare is it that someone faces up to their own personal failure with a “nobody’s fault but mine” attitude? What we’re looking at here is a 16 year-old who has the ability to think her way through a problem, but not manage the emotions that come from it. Because adults can do that right? The competitive desire and will that put a teenager on the floor in London are also the same things that fuel the tempestuous emotions of a 16 year-old girl. Figuring out how to channel and manage those emotions is every bit as difficult as navigating the balance beam and as complex as a floor routine. Nobody scores a 10 every night, especially when their dreams are on the line. Olympic history demonstrates that the medal podium is the last place that we want to see uncomfortable displays of authenticity. even if they are a 16 year-old girl with a broken heart. Adulthood doesn’t get any easier McKayla, but it does get better. Sadly, My next blog will have to be about something non Olympics related!